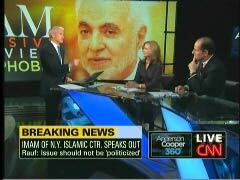 CNN offered a sneak preview of their upcoming Parker-Spitzer program on Wednesday's Anderson Cooper 360 with the new hosts, pseudo-conservative Kathleen Parker and "Client Number Nine" Eliot Spitzer agreeing that the "well-spoken" Imam Feisal Rauf changed few minds with his recent interview. The two also forwarded their network's charge that "Islamophobia" is growing in the U.S.
Anchor Anderson Cooper began the segment by asking the two about Soledad O'Brien interview of Rauf, which took place the previous hour. Parker, the "Pulitzer-Prize winning journalist and noted conservative commentator," as Cooper called her, endorsed his appearance and went on to characterize the two sides of the debate over the planned Ground Zero mosque. In her view, those who oppose it "were going to sort of be looking for ways to convince yourself that he was...trying to be this, sort of, secret jihadist." On the other hand, the supporters of the mosque "understand that he seemed as a reasonable, rational person who's well-spoken and has something important to say." 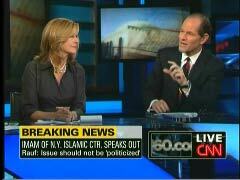 SPITZER: I think Kathleen got it exactly right. You saw in his commentary- which I found persuasive, thoughtful, and very well-spoken- precisely what you believed going in...Those who were skeptics heard, in his invocation of national security, a threat. Others, who were more sympathetic to him, understood that, in the context of international affairs, his saying- look, be careful that we don't create additional reasons for those who are radicals to hate us. And so, you can use this as a Rorschach test, and see in it exactly what you already believe. Later, the CNN anchor brought up some of the wider controversies involving Islam in the United States and raised the "Islamophobia" charge: "We've seen these incidents now moving away from just this mosque, but to opposing- some oppose the building of any new mosque in the United States, or some expose just the expansion in Murfreesboro, Tennessee. And those who support it say, 'Look, this is Islamophobia.' Do you buy that?" SPITZER: I think there's a big element of Islamophobia, but I think this is also part of our history, and we need to be careful that we appeal to our better angels, as Lincoln said.....I dug out George Washington's letter to a synagogue in Newport, Rhode Island in 1790, where he addressed this and he said the wonderful thing about this nation, a new nation at that point, three years old- 220 years ago, he wrote this- is that we are tolerant, and we need our political leadership to speak to tolerance. We need to go back to those values, so that everybody can do what the imam wants to do. The Democrat actually erred with his history, as the U.S. wasn't three years old in 1790, but fourteen years old, if you date it from the adoption of the Declaration of Independence in 1776. His future co-host raised another common liberal argument, that many were just ignorant of Islam and Muslims: "We keep hearing this, 'they're going to do this, if you let them get in.' You let them do this, then they're going to demand, demand. Who is the 'they'? I mean, these are Americans, too, and it makes me wonder how many people out there watching tonight actually know someone who is a Muslim?...I think we've got to stop thinking of Muslims as being 'them.'" One might surmise from this appearance, given the former governor's liberal credentials, and Parker's swipes at conservatives, as she did earlier in September against Glenn Beck and Sarah Palin, that CNN's upcoming program is going to be less like Crossfire and more like an Amen corner. COOPER: Joining me now are Elliot Spitzer, the former governor of New York, and Kathleen Parker, Pulitzer-Prize winning journalist and noted conservative commentator. In October, their new program begins right here on CNN at 8 pm. Welcome, thanks very much for being with us- good to have you here. KATHLEEN PARKER: Thanks, Anderson. Thanks for having us. COOPER: What did you think of the imam tonight? PARKER: You know, I thought it was very good that he came out and spoke and that people could see him in person and hear his voice. I think he probably changed very few minds. I think people are going to see exactly what they were already prepared to see. If you're against it, you were going to sort of be looking for ways to convince yourself that he was playing some role- you know, in trying to be this, sort of, secret jihadist. And then, if you were for it already, then you understand that he seemed as a reasonable, rational person who's well-spoken and has something important to say. I doubt that he really changed many hearts and minds, but maybe, it's a start, as he says, toward a conversation that needs to take place. COOPER: Elliott, do you think he changed minds? COOPER: The lines are so clearly drawn, right? SPITZER: The lines are so rigid, and the views about this are so deeply ingrained and the passion- when you've lost somebody on 9/11, and the pain is so real, it's very hard to change minds. COOPER: So, are we beyond a place where there is dialogue or possibility of coming together to- you know, David Gergen talked about some sort of solution of having- you know, a multi-faith center, is it- or are we beyond that? COOPER: You're talking about- not the people who oppose the mosque? PARKER: There is some crackpot-ism involved in this. I mean, there was a time when the headlines were fairly rational and straightforward and news-oriented, and you can see that was last December, as he said. And then, if you look at the headlines beginning last May, then they get increasingly inflammatory. And so- you know, I think that the rhetoric has been highly exaggerated in many cases. The media- you know, we all have a role in that and we have to be so careful, because when we do give attention to people like- for example, this fellow in Gainesville who's threatening to burn the Koran. I was talking to a friend of mine earlier tonight who lives in Gainesville. And I said, 'Do you know this character?' And she said, 'Yeah, my church is about a quarter mile down the road from his.' His church is a metal building. He's got approximately 50 followers. COOPER: And sells used furniture on eBay. PARKER: Yeah, and I would like for the Muslim world to understand that this is just one individual who doesn't represent anyone but- you know, a handful of folks. That's just- and that feeds, though, and builds this sort of- the sense that this is an awful thing going on. SPITZER: We need for time to pass. When emotions are this raw, you cannot address the issues rationally, because emotion overwhelms rationality. Andy [Sullivan], in your prior panel, said something very interesting and very important. He said this was the last straw for a middle class that is disenfranchised. Now, this issue is one of many that has led to an outbreak of anxiety, anger, venom- in many cases, legitimate because of emotions that derive from 9/11. In other instances, it is just a focal point for an upset with the way our economy and our national politics is playing out. And so, we need to understand this in that context, and I think when you view it that way, you understand how hard it is to bridge this chasm right now. COOPER: There's- you know, we've seen these incidents now moving away from just this mosque, but to opposing- some oppose the building of any new mosque in the United States, or some expose just the expansion in Murfreesboro, Tennessee. And those who support it say, 'Look, this is Islamophobia.' Do you buy that? SPITZER: I think there's a big element of Islamophobia, but I think this is also part of our history, and we need to be careful that we appeal to our better angels, as Lincoln said. COOPER: This is just the newest group? COOPER: But that's not what our political life is about now. COOPER: We've got to take a quick break. Elliot Spitzer, Kathleen Parker, appreciate you being with us. Thanks very much.